As Nancy Southern pointed out in her recent post, engaging with China presents certain challenges because of the different value systems in play. China has moved extraordinarily swiftly to become the world power it is today, and its values do not include an emphasis on individual rights and liberties that are part of civil society in the U.S.
At a high systemic level—in the political, economic, and social realms—the evolution of China into an economic dragon gives us an opportunity to work with diverse value systems and perspectives as we explore how to create educational relationships and partnerships with China. Just as we clashed with the native peoples of the West as the U.S. expanded during the 18th century, the Chinese are clashing with the Tibetan and Uighur peoples. These clashes affect individuals and groups, and are destroying the fabric of the minority cultures within China. The Tibetans, in particular, are facing cultural genocide as their deeply religious society is contained and suppressed by the Chinese government. I spoke with two Tibetans here in the United States, Dorje and Norbu (not their real names) to help me understand and voice what the Tibetan people are experiencing. Dorje is accomplished in the creation of sand mandalas and teaches children at charter schools in his city about Tibetan culture and the practice of creating mandalas. When he works with Chinese students, Dorje confronts many misconceptions about his people that are inculcated through Chinese education. “I was talking to a young student and she asked me, ‘Can you go back to Tibet?’” Dorje said, telling her he couldn’t. “She couldn’t believe Tibetans were suffering in Tibet.” She had always heard that Tibet was a backward, barbarian place where people kill each other and monks eat human flesh, Dorje told me. This kind of prejudice is fostered through educational systems that identify and devalue differences. To keep the misconceptions alive and hide abuses, the Chinese government prohibits reporters from entering Tibet and all use of cameras is restricted. 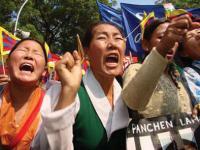 Still, news of desperate events in Tibet has slipped out. Over the last several months, 11 Tibetans have immolated themselves in protest of the Chinese occupation of Tibet. Norbu expressed the reasons for the immolations a bit differently. Norbu also talked of how pervasive the Chinese propaganda against the Tibetan people is. This devaluing of human life has reached systemic levels in Tibet. The Tibetan Center for Human Rights and Democracy (or TCHRD) tracks and reports on what is going on in Tibet, including the immolations and patterns of systematic persecution with the personal profiles of political prisoners. TCHRD provides video footage of the complete destruction of the Serthar Institute, a center for Buddhist studies that once housed 9,000 monks and nuns. Despite the oppression of the Tibetan people, both Norbu and Dorje have aspirations for Tibet and for the world. Dorje expressed a wish for a better century than the last. Norbu shared that sentiment, and added that he hopes Tibetan culture and its Buddhist religion can be preserved. Tibet’s offer of human happiness is, sadly, in conflict with the economic ambitions of many countries around the world. The Tibetans’ struggles are not so different from other the struggle of other religious groups sharing a region, like Palestinian and Israeli, for example. The difference is the powerful systemic destruction the Chinese government is wielding against the fabric and society of the Tibetan people. And perhaps we have made a devil’s bargain, accepting and allowing the destruction of a people to ensure our own economic gain. We struggle with differences in the U.S. and our track record includes violence as we’ve fought to uphold equal rights for all. Our struggles for equality continue today with gay rights and women’s rights at the forefront of the presidential debates. The conflict between different perspectives and values is a pattern that echoes around the world. As a species, we humans use strategies that get us into trouble and cause suffering for ourselves and others. Because we can recognize differences, which are an essential part of our brain’s capacity, we can discern and discriminate us versus them. But as Rick Hanson pointed out in his 2009 book Buddha’s Brain: The Practical Neuroscience of Happiness, Love and Wisdom, we create boundaries and separations from ourselves and the world, and from one thing to another instead of recognizing our interconnectedness. Learning to balance our strategies for survival and upholding human values because we understand how interconnected we are is challenging. But, “as the leader of the free world, [the U.S.] can make a statement about basic human rights and religious freedoms,” Norbu said. Upholding our values and, simultaneously, pursuing an economic agenda is a tightrope walk with serious consequences if our human values lose ground—consequences for the Tibetan people, consequences for us, consequences for the global community. I hope we get better at serving life as we continue to partner with the economic dragon that China has become. Ironically, 2012 is the Chinese year of the dragon. My hope is that, someday, the Chinese dragon supports the dignity of all life so that the Tibetan people will taste freedom once again.